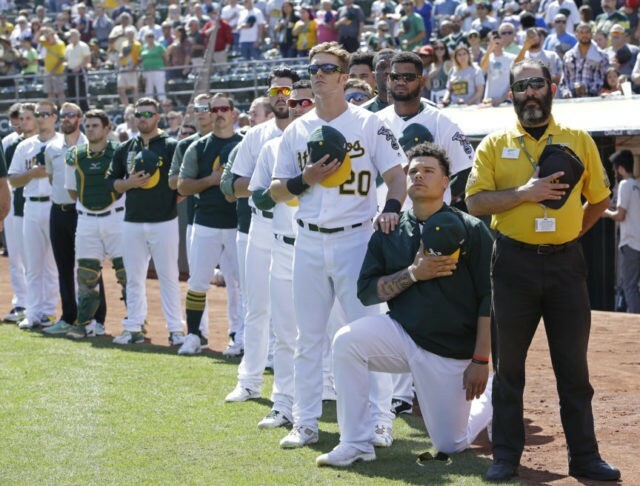 OAKLAND, Calif. (AP) — Oakland Athletics catcher Bruce Maxwell pressed a hand to his heart and took to a knee for the national anthem for the second straight game Sunday, part of a protest movement that has been criticized by President Donald Trump. On Saturday, the 26-year-old rookie became the first major league baseball player to kneel during “The Star-Spangled Banner” before the A’s played Texas. Again Sunday, teammate Mark Canha put a hand on Maxwell’s shoulder in a show of support like he also did Saturday. Maxwell received support from NBA Finals MVP Kevin Durant of the NBA champion Golden State Warriors. A’s manager Bob Melvin said Maxwell’s protest was a courageous act, noting that the decision to become the first player in the majors to adopt the protest came with risk. Canha acknowledged trepidation about his decision to support Maxwell. Canha, who grew up in the San Francisco Bay Area and played at California, said he shares the values of one of the nation’s most politically progressive regions.